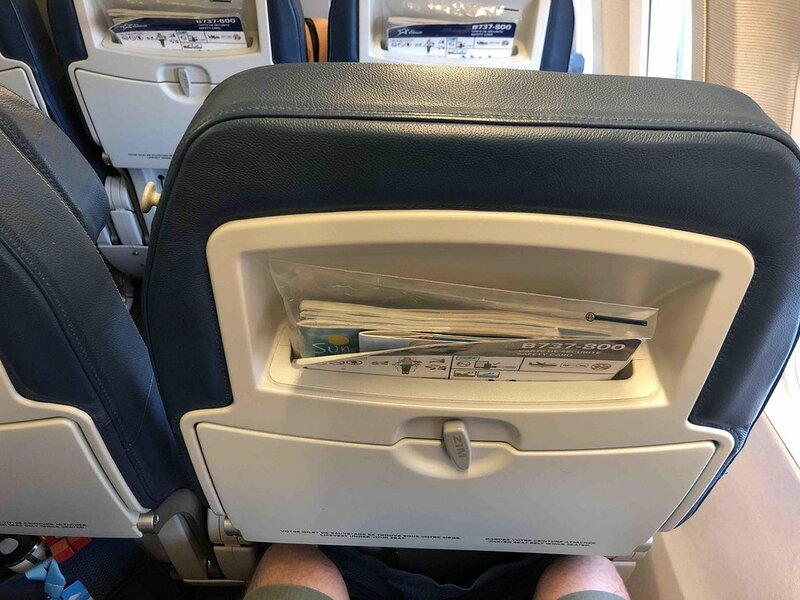 1 A None No Power Seat 1 A is a standard Economy Class seat that Air Transat designates as having extra legroom but the proximity to the lavatories may be bothersome. There is no floor storage for this seat during takeoff and landing. The tray table is in the armrest, making the armrest immovable and slightly reducing seat width. 1 B None No Power Seat 1 B is a standard Economy Class seat that Air Transat designates as having extra legroom but the proximity to the lavatories may be bothersome. There is no floor storage for this seat during takeoff and landing. The tray table is in the armrest, making the armrest immovable and slightly reducing seat width. 1 C None No Power Seat 1 C is a standard Economy Class seat that Air Transat designates as having extra legroom but the proximity to the lavatories may be bothersome. There is no floor storage for this seat during takeoff and landing. The tray table is in the armrest, making the armrest immovable and slightly reducing seat width. 14 H None No Power Seat 14 H is a standard Economy Class seat that may have limited recline due to the Exit Row behind. 14 J None No Power Seat 14 J is a standard Economy Class seat that may have limited recline due to the Exit Row behind. 15 A None No Power Seat 15 A is a standard Economy Class seat that Air Transat designates as having extra legroom. This seat is available at booking for an additional cost. This seat may have limited recline due to the Exit Row behind. There is no floor storage for this seat during takeoff and landing. The tray table is in the armrest, making the armrest immovable and slightly reducing seat width. 15 B None No Power Seat 15 B is a standard Economy Class seat that Air Transat designates as having extra legroom. This seat is available at booking for an additional cost. This seat may have limited recline due to the Exit Row behind. There is no floor storage for this seat during takeoff and landing. The tray table is in the armrest, making the armrest immovable and slightly reducing seat width. 15 C None No Power Seat 15 C is a standard Economy Class seat that Air Transat designates as having extra legroom. This seat is available at booking for an additional cost. This seat may have limited recline due to the Exit Row behind. There is no floor storage for this seat during takeoff and landing. The tray table is in the armrest, making the armrest immovable and slightly reducing seat width. 15 H None No Power Seat 15 H is a standard Economy Class seat that Air Transat designates as having extra legroom. This seat is available at booking for an additional cost. This seat may have limited recline due to the Exit Row behind. There is no floor storage for this seat during takeoff and landing. The tray table is in the armrest, making the armrest immovable and slightly reducing seat width. 15 J None No Power Seat 15 J is a standard Economy Class seat that Air Transat designates as having extra legroom. This seat is available at booking for an additional cost. This seat may have limited recline due to the Exit Row behind. There is no floor storage for this seat during takeoff and landing. The tray table is in the armrest, making the armrest immovable and slightly reducing seat width. 15 K None No Power Seat 15 K is a standard Economy Class seat that Air Transat designates as having extra legroom. This seat is available at booking for an additional cost. This seat may have limited recline due to the Exit Row behind. There is no floor storage for this seat during takeoff and landing. The tray table is in the armrest, making the armrest immovable and slightly reducing seat width. 16 A None No Power Seat 16 A is a standard Economy Class seat that Air Transat designates as having extra legroom. This seat is available at booking for an additional cost. There is no floor storage for this seat during takeoff and landing. The tray table is in the armrest, making the armrest immovable and slightly reducing seat width. 16 B None No Power Seat 16 B is a standard Economy Class seat that Air Transat designates as having extra legroom. This seat is available at booking for an additional cost. There is no floor storage for this seat during takeoff and landing. The tray table is in the armrest, making the armrest immovable and slightly reducing seat width. 16 C None No Power Seat 16 C is a standard Economy Class seat that Air Transat designates as having extra legroom. This seat is available at booking for an additional cost. There is no floor storage for this seat during takeoff and landing. The tray table is in the armrest, making the armrest immovable and slightly reducing seat width. 16 H None No Power Seat 16 H is a standard Economy Class seat that Air Transat designates as having extra legroom. This seat is available at booking for an additional cost. There is no floor storage for this seat during takeoff and landing. The tray table is in the armrest, making the armrest immovable and slightly reducing seat width. 16 J None No Power Seat 16 J is a standard Economy Class seat that Air Transat designates as having extra legroom. This seat is available at booking for an additional cost. There is no floor storage for this seat during takeoff and landing. The tray table is in the armrest, making the armrest immovable and slightly reducing seat width. 16 K None No Power Seat 16 K is a standard Economy Class seat that Air Transat designates as having extra legroom. This seat is available at booking for an additional cost. There is no floor storage for this seat during takeoff and landing. The tray table is in the armrest, making the armrest immovable and slightly reducing seat width. 2 H None No Power Seat 2 H is a standard Economy Class seat that Air Transat designates as having extra legroom but the proximity to the lavatories may be bothersome. There is no floor storage for this seat during takeoff and landing. The tray table is in the armrest, making the armrest immovable and slightly reducing seat width. 2 J None No Power Seat 2 J is a standard Economy Class seat that Air Transat designates as having extra legroom but the proximity to the lavatories may be bothersome. There is no floor storage for this seat during takeoff and landing. The tray table is in the armrest, making the armrest immovable and slightly reducing seat width. 2 K None No Power Seat 2 K is a standard Economy Class seat that Air Transat designates as having extra legroom but the proximity to the lavatories may be bothersome. There is no floor storage for this seat during takeoff and landing. The tray table is in the armrest, making the armrest immovable and slightly reducing seat width. 3 H None No Power Seat 3 H is a standard Economy Class seat that Air Transat designates as having additional legroom. There may be an additional charge for booking this seat. 3 J None No Power Seat 3 J is a standard Economy Class seat that Air Transat designates as having additional legroom. There may be an additional charge for booking this seat. 3 K None No Power Seat 3 K is a standard Economy Class seat that Air Transat designates as having additional legroom. There may be an additional charge for booking this seat. 31 C None No Power Seat 31 C is a standard Economy Class seat, however, the proximity to the lavatories may be bothersome. 31 H None No Power Seat 31 H is a standard Economy Class seat, however, the proximity to the lavatories may be bothersome. 32 A None No Power Seat 32 A is a standard Economy Class seat in the last row of the plane and may have limited recline. The proximity to the galley and lavatories may be bothersome. 32 B None No Power Seat 32 B is a standard Economy Class seat in the last row of the plane and may have limited recline. The proximity to the galley and lavatories may be bothersome. 32 C None No Power Seat 32 C is a standard Economy Class seat in the last row of the plane and may have limited recline. The proximity to the galley and lavatories may be bothersome. 32 H None No Power Seat 32 H is a standard Economy Class seat in the last row of the plane and may have limited recline. The proximity to the galley and lavatories may be bothersome. 32 J None No Power Seat 32 J is a standard Economy Class seat in the last row of the plane and may have limited recline. The proximity to the galley and lavatories may be bothersome. 32 K None No Power Seat 32 K is a standard Economy Class seat in the last row of the plane and may have limited recline. The proximity to the galley and lavatories may be bothersome. 4 H None No Power Seat 4 H is a standard Economy Class seat that Air Transat designates as having additional legroom. There may be an additional charge for booking this seat. 4 J None No Power Seat 4 J is a standard Economy Class seat that Air Transat designates as having additional legroom. There may be an additional charge for booking this seat. 4 K None No Power Seat 4 K is a standard Economy Class seat that Air Transat designates as having additional legroom. There may be an additional charge for booking this seat. 5 H None No Power Seat 5 H is a standard Economy Class seat that Air Transat designates as having additional legroom. There may be an additional charge for booking this seat. 5 J None No Power Seat 5 J is a standard Economy Class seat that Air Transat designates as having additional legroom. There may be an additional charge for booking this seat. 5 K None No Power Seat 5 K is a standard Economy Class seat that Air Transat designates as having additional legroom. There may be an additional charge for booking this seat. Air Transat offers complimentary special meals which must be requested through the Information and Seat Selection Centre at 1-877-872-6728. Passengers who are hearing impaired can call 1-866-234-5136 (TTY) toll free within North America or 514-906-5196 in the local Montreal area. To be honoured, special meal requests must be received with a minimum notice of 72 hours prior to departure. Please refer your travel agent to the appropriate IATA code (see list below) for the special meal(s) you require. Please note that only one special meal per person can be ordered and meal combinations will not be honoured. The following special meals are available. For more information, go to Air Transat Meals. This Boeing 737-800 has 189 seats in a one-class configuration and is flown internationally. This is a great seat and there is plenty of floor storage under the seat in front of you. Do NOT sit in this seat unless you don't your space being invaded the entire flight. There is a curtain right at the bulkhead which is often closed and people stuff themselves in the aisle (aka. your leg/shoulder area) waiting for the washroom. Paying $50 for this seat is an insult and Air Transat should seat someone there for free and should be used as a last resort seat! Smaller space to put things under the front seat. Air Transat flies 2 versions of Boeing 737-800 .